Too bad they couldn't get around to fixing it before the rainiest spring since the Great Flood. 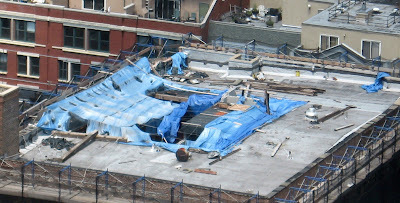 The tarp on top of 20 Henry Street in Brooklyn Heights has been torn to shreds since February and all kinds of complaints have been filed, but now, according to the Brooklyn Eagle, the giant hole in the roof of the old Peaks Mason Mints building (AKA "Candy Factory") might get fixed. There's been a dramatic cast change for this little Elmo. How could they!? 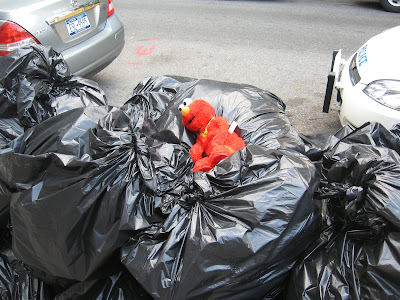 Elmo was last seen on Montague Street in Brooklyn Heights. Kudos to P.S. 29 for their gardening project, which can be seen greening up the Cobble Hill school's playground this summer. The garden is lush with tomatoes, squash, peas, beans,carrots and more. P.S. 29 is a Youth Garden Grants 2009 award winner. The National Gardening Association awards Youth Garden Grants to schools and community organizations with child-centered garden programs with an educational focus. 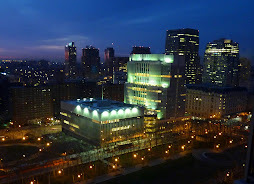 - City Point, the giant multi-use complex that was to be "Downtown Brooklyn’s own Time Warner Center," will now be built in two phases, according to the Observer. "Shop Brooklyn" runs today through tomorrow (7/29 - 7/30). Participating stores in Downtown Brooklyn, Fort Greene, Park Slope, Williamsburg and Bay Ridge are open till 10 p.m. with special events, discounts and refreshments. A couple of examples -- Try Rae's First, at 430 Court Street, is having a 30 - 40% off super sale. Gumbo, at 493 Atlantic Ave. is having a trunk sale and a free children's class and is giving away refreshments. 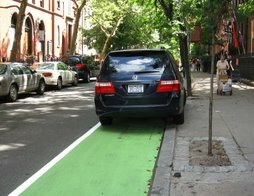 See www.ishopbrooklyn.com for further details. Carroll Park Concert Series presents Starfish today, July 29, bringing rock and roll energy and loads of kid-friendly activities to the park. With five seasoned dads/musicians, NJ-based Starfish gives classic rock style a total makeover. The tunes mix witty lyrics with electric guitar, giving kids and grownups the chance to have fun together and dance to the music, doing air guitar moves and enjoying a bubble machine to enjoy songs that remind them of the 60's and 70's. 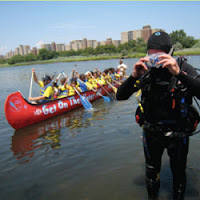 Extra attractions: The "Be a Brooklyn Reader: Summer Reading at our Local Library" will come to the park. The Carroll Park Branch of Brooklyn Public Library will be on hand to inspire and give information about summer reading and the library programs. Also, Y Water, a new low calorie, organic beverage, will be available for free tastings (first come first serve). Please come with pocket money for crafts and treats, including face painting by Gymstars and food and drink provided by Moxie Spot. 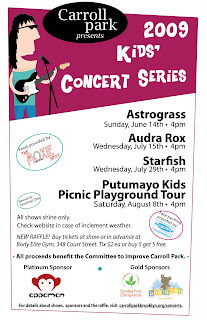 Fun starts at 3:30, music starts at 4 p.m.
With neighborhood mom and volunteer Simmi Degnemark at the helm, the Series will end with a finale on August 8th, with rock world music icon Putumayo Kids at the park for a CD release party. All proceeds benefit the Committee to Improve Carroll Park. To help you cope while you're broke, make sure you check out the Brokelyn blog. Brokelyn knows a way to stretch $10 worth of pork into a feast for a dozen, and where to find cheap or free health clinics. Here's another way to save money while you're looking for work: Not Eating Out in New York. Blog author Cathy is serious about not eating out; she spent two years diving into dumpsters, foraging for edible weeds, cooking for communal dinners and supper clubs, and throwing amateur cook-offs. There's stuff for non-cooks as well: learn what to add to instant ramen to make it awesome. - The Kings Bay YM/YWHA, located in Sheepshead Bay, is seeking to hire a full-time office clerk for everyday tasks at the center. Craigslist They also need a part time clerk, here. And they need a part time executive assistant, here. 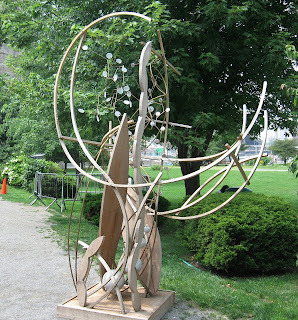 The Brooklyn Waterfront Artist Coalition's (BWAC) 27th annual outdoor sculpture show opened this weekend at Empire-Fulton Ferry and Brooklyn Bridge Parks in DUMBO. "Since the financial world seems to be focusing on the lack, this show points out that the bottom line provider, planet Earth, still provides for the people; the same way it did before the big financial crisis. The show focuses on work that is made from materials that are abundant; not scarce and expensive like a precious metal but rather plentiful or left over from something else." 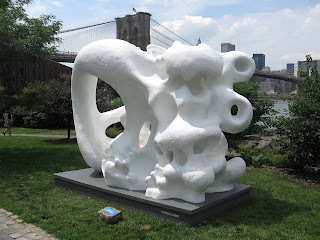 Make sure you get to DUMBO before the show closes on September 5th. The fact that everything's homemade (try the scones!) and an effort is made to use sustainable sources is a big draw. The mouthwatering bacon is from a local farm. And you can't beat the location -- right next to charming Cobble Hill Park. Lots of stroller moms here. But for the first year of their existence, there was no public bathroom, which certainly kept some coffee-drinking customers away (and really alienated those with young children and/or enlarged prostates). The day before yesterday, however, a poster on Brownstoner said there is now a sign indicating a bathroom has opened downstairs. Could it be true? If so, Ted & Honey are pushing closer to perfection. This used to be the Verandah Deli (the Red Deli), which we always enjoyed. Note that Ted & Honey is closed Mondays. The Bergen Carroll blog has been following Ted & Honey as well. 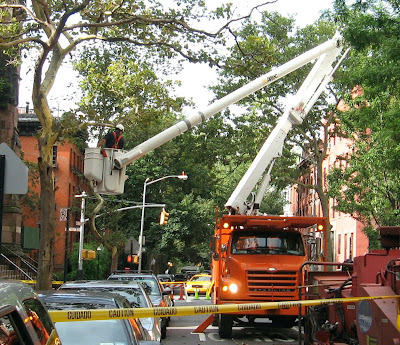 A tree trimming job on Clinton Street near Livingston in Brooklyn Heights has the street closed today from morning into midday. 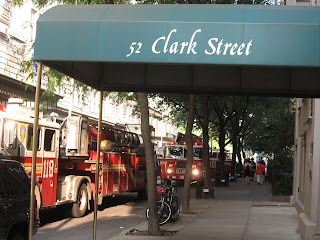 There was a flurry of excitement on Clark Street in Brooklyn Heights Wednesday afternoon as smoke was reported at 52 Clark Street. Four fire trucks and a couple of emergency vehicles took over the street and fully loaded firefighters poured into the building. 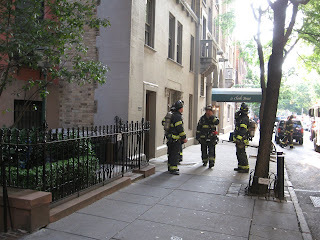 But no fire was found, and the smoke dissipated. After the search was completed, everyone went home. IKEA Tuesday announced that on Aug. 3 it will begin charging a fee to weekday riders of its water taxi service who do not shop at its Red Hook store. Eye Heart New York says this isn't fair, that IKEA promised free water taxi rides when they were trying to get into Red Hook, and that the city subsidizes the water taxi. The water taxi is good for Red Hook -- loads of folks are using them to get to the Red Hook ball fields, the waterfront art show etc. - This article in the Observer indicates that the water taxi wasn't meant to be free forever. - But this article says it was: "Ikea spokesman Joseph Roth says the new services would be available to anyone, not just customers of the store." A new water taxi dock at Pier 6 is scheduled to be announced this morning at Brooklyn Bridge Park. The new dock will provide direct ferry service between Brooklyn Bridge Park and Governors Island. 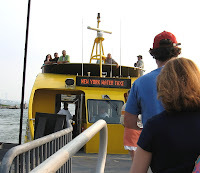 Pier 6 is just a stone's throw from Governors Island, so this should be the shortest ferry ride in New York City. Expected to gather at 10 a.m. for the announcement are Chris Ward, Executive Director of the Port Authority; Regina Myer, Brooklyn Bridge Park Development Corporation President; Leslie Koch, Governors Island Preservation and Education Corporation President; Assemblywoman Joan Millman; NYC Parks Commissioner Adrian Benepe; and Brooklyn BP Marty Markowitz. 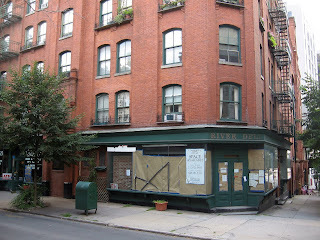 A&G River Deli at 34 Columbia Place and Joralemon has applied for a liquor license for a small Italian restaurant at the site of the old Riverside Deli (on the ground floor of the historic Riverside Apartments). Giovanna Fada, proprietor, runs another establishment on Mott St. in Manhattan. 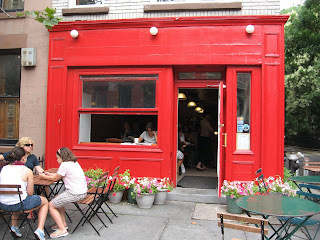 According to the Ft. Greene blog the restaurant will be open for dinner Monday - Friday, and from 11 a.m. to midnight/1 a.m. on weekends. They're also planning on applying for an outdoor cafe in the future. According to the Real Deal, the owners have signed a ten year lease. In April, McBrooklyn reported that many of the retail sites on the ground floor of the complex had been put up for rent. It's long been a mystery as to why the controversial owner of the apartments (the Pinnacle Group) cleared out the retail tenants on the ground floor and left the spaces empty for years. Meanwhile, the ongoing saga of the planned underground garage at the complex just took another turn. - Riverside Apartments Gets New Tenant? We at McBrooklyn like to keep up with all the latest cultural memes. 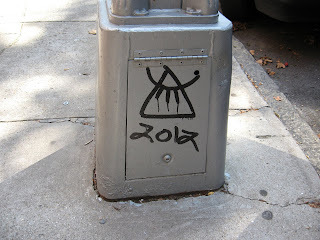 So, is this the official symbol of the end of the world in 2012? Or a sign of the Galactic Alignment? Rearranged symbol of the Illuminati? Or just some graffiti? Here's a quick read: "Where, Oh Where, Has My Application Gone?" by Phyllis Korkki in Sunday's New York Times. This is a useful article about how to get your application noticed by the hiring manager. Also, check out the Unemployed Brooklyn blog, written by Matchgirl, who's unemployed and in the fashion industry. Matchgirl discusses topics like networking, health insurance, food stamps and clothing swaps with humor and empathy. - Boar's Head needs a quality assurance manager (here), an employee relations coordinator (here) and a safety and health coordinator (here). Also, artists, videographers and photographers will be present along with the High Bridge Children's Art Show II. Hi, I'm Miss Cyclone. I’m Calling to Save Coney Island. While the Bloomberg administration, the City Council and developers are negotiating the future of Coney Island, the group Save Coney Island says they won't let them (and other fans of the “People’s Playground”) into the discussion. So Save Coney Island is taking its message directly to the people, with some help from Miss Cyclone Angie Pontani. Friday, the burlesque bombshell telephoned thousands of New Yorkers (with an assist from robo-call technology) to urge them to help Save Coney Island. Listen to Angie’s message here. NYPD cars and motorcycles on the Promenade, helicopters hovering over Brooklyn Heights and the Coast Guard in the East River -- this evening's bru-ha-ha was all about security for President Obama's visit to New York City to address the NAACP on their 100th anniversary. Spectators pointed to the heliport across the East River to what appeared to be President Obama's copter. 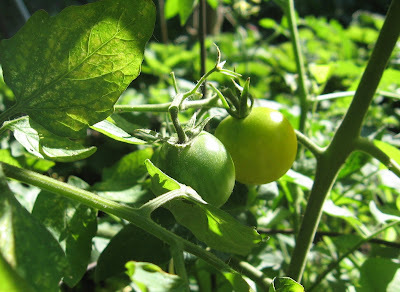 These little beauties are ripening into yellow cherry tomatoes. We're growing plum tomatoes, string beans, peppers and a few other crops as well. 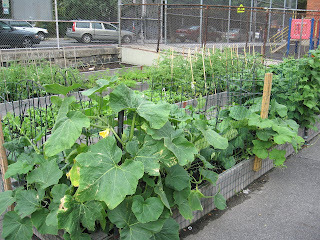 Brooklyn actually has a great environment for farming (if you clean up that contaminated soil). If you have a backyard or other outdoor space that might be good for farming but aren't really up to it, consider contacting BK Farmyards. 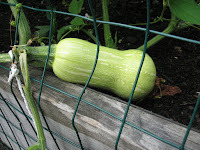 BK Farmyards is a network that will grow organic vegetables in your yard or lot for sale to your neighbors. In exchange, they’ll give you a percentage of the crop for free. There are about six plots currently being farmed, adding up to more than three acres. BK Farmyards is a finalist in the 2009 Buckminster Fuller Challenge. It's Going to be Awesome!!! (Note that one article is made a day.)" So, if anyone is familiar with the creator of www.wwwbunnyblogcom.blogspot.com, let us know what's going on. 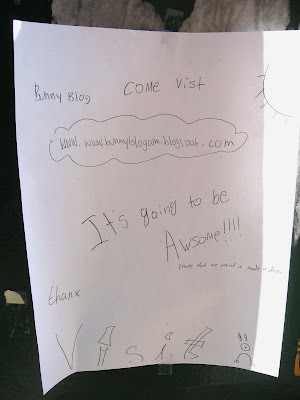 We'd love to read a young blogger's bunny blog: It sounds awesome! 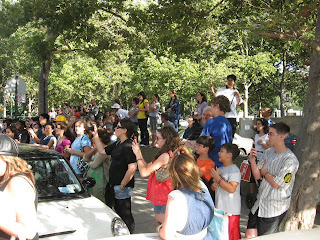 Crowds of teen-aged girls flocked to Brooklyn Heights yesterday to try to catch Rob Pattinson (Twilight) in the filming of Remember Me. Above, fans wait near Pattinson's trailer, hoping to catch a glimpse. Other fans were thrilled to see Pierce Brosnan wandering the streets of the Heights. Filming took place all over the Heights. 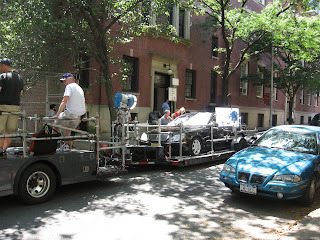 Above, a crew prepares for a car scene on Hicks Street. Wait -- Has Whole Foods Given Up On Gowanus? Yes. No. Yes. No. 1. The Brooklyn Paper reports that Whole Foods has finally given up on building a store in Gowanus. 2. Whole Foods issues a letter saying that they definitely haven't given up on Gowanus. 3. The Brooklyn Paper insists that Whole Foods said they are giving up on Gowanus, and prints an email sent by a Whole Foods representative that sounds like they might be giving up on Gowanus. 4. Whole Foods again denies they are giving up on Gowanus, saying, "Whole Foods Market is actively working on plans for a store at the Gowanus site, and we want to be sure that the Brooklyn Paper's readers understand that fact." Yes? No? Gosh, we don't know who to believe! 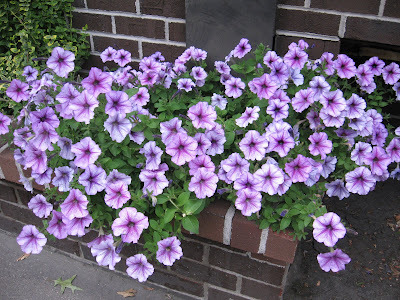 At dusk, these flowers almost glow. Park Plaza Diner, Brooklyn Heights. Want to eat well -- and relatively cheaply? New York Magazine has come up with a list of 22 tasty Cheap Eats venues across New York City, and half of them are in Brooklyn. Cheap, in this case, doesn't mean McDonalds or $4 dinners, as some commenters desire. It means Dr. Pepper ribs ($16), mayby with collard greens cooked with with ham hocks ($4) at The Brooklyn Star in Williamsburg, or Zuzu's thai-inspired ramen ($10) in Park Slope. We'd call them reasonably priced, and we hope to eat at as many as we can afford. The Brooklyn Lyceum will be presenting classic movies on Friday evenings at 8 p.m. during the summer. Cost: $5. More info here. McBrooklyn received an email today from Save Coney Island, which released a statement from Jane Jacobs’s son, Ned Jacobs, in which he said he was “appalled” by the City’s rezoning plan for Coney Island. City officials gathered today on Hudson Street in the West Village to honor his mom, an urban visionary, with a street renaming. 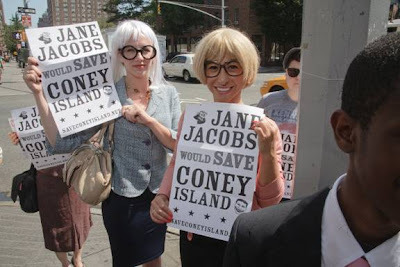 “While I cannot speak on behalf of my mother, the late Jane Jacobs, or predict what she would think about particular proposals today, in my view, this rezoning plan for Coney Island does not appear to reflect the urban values and planning principles she espoused,” wrote Jacobs. The City’s current rezoning plan would "obliterate Coney Island’s historic and distinctive character," according to Save Coney Island. The City’s plan rezones most of Coney Island, leaving "a narrow strip of 12 acres for a shrunken amusement park.” It inserts four high-rise hotel towers, up to 27 stories, into the historic, low-rise, amusement district. The City's rezoning plan can be seen here. According to the City, the amusement and entertainment district will consist of 27 acres and will foster year-round activity. The New York Times ran an editorial yesterday urging its passage but supporting the Municipal Art Society's’ recommendations to improve the plan. A full Council vote is due by August 7. 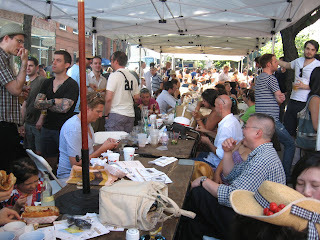 Brooklyn celebrated Bastille Day Sunday on Smith Street and it seemed like half of France was there. 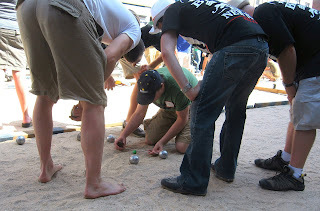 Petanque players had an extra set of sand-covered courts to play on this year. The sand was delivered to Smith Street by John Quadrozzi's cement company. 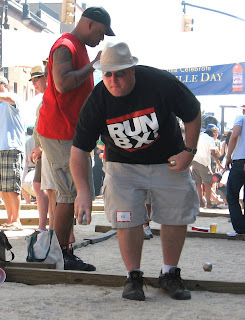 Competitors throw metal balls (boules), trying to get close to a little ball called a "pig" (cochonnet). There were 80 teams competing this year, some top notch, others just out for fun. Sometimes it came down to a millimeter. Then the measuring tape was pulled out. Though the crowd was huge, there was plenty of food and drink. Bar Tabac is a major sponsor (along with Robin des Bois and Ricard). There were shady tents to eat under, talk and listen to music. 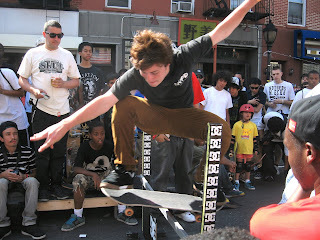 Spectators gathered at the north end of Smith Street to watch the dare-devil skateboarding competition, now in its third year, courtesy of the Homage skateboarding shop. 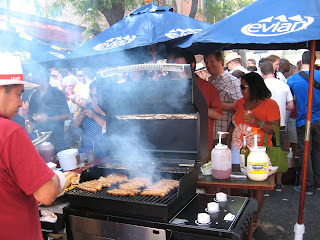 More great photos at the Pardon Me For Asking blog. 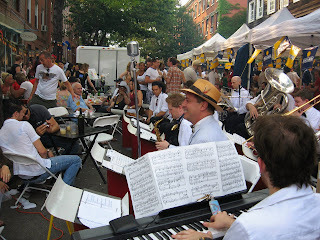 - Bastille Day in Brooklyn -- La Rue de Smith Sautait! 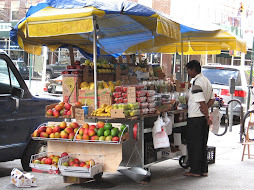 I am writing with just a quick update to let you know that recent reports of Whole Foods Market's demise in Brooklyn seem to have been greatly exaggerated! 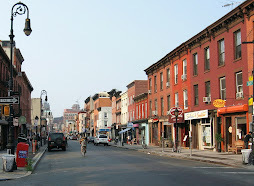 As you may have seen, the Brooklyn Paper published a story this week that inaccurately suggests we have definitively decided not to pursue the development of a store on our property at 3rd Street and 3rd Avenue and further that we are planning to sell the property. This is simply not true and we have sent a letter to the Brooklyn Paper editor clarifying our position and requesting a correction. You may recall that last Fall I sent you a memo explaining that Whole Foods Market had begun re-evaluating our plans for our property and that we would be working to identify potential development partners for a Brooklyn store. That is exactly what we have been doing in recent months and we are continuing these efforts in hopes of arriving at a potential development scenario that will enable us to finally come to Brooklyn. Therefore, while nothing has yet been finalized and we are still not in a position to be able to share any additional information, please be assured that we will be back in touch as soon as we are able to provide more details about our plans. 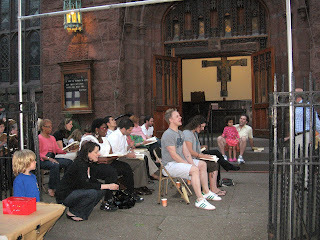 Thursday evening a lovely sound echoed along Henry Street in Brooklyn Heights as a come-as-you-are pickup choir sang their hearts out in front of the First Presbyterian Church. Accompanying the singers were musicians playing guitar, keyboards and drums. The sing will be repeated every Thursday evening, and all are invited. - Whole Foods finally gives up on Gowanus. Brooklyn the Borough via Brooklyn Paper Not so! See the radical update HERE. 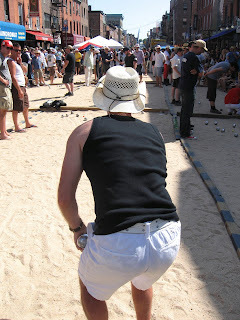 Petanque, Gauloises cigarettes, Ricard, French music, French food, even a guillotine. Smith Street will celebrate Bastille Day Sunday and there's something for everyone. The biggest Bastille Day in the U.S. takes place from noon - 10 p.m. this year. (Last year it ended at 8 p.m. and nobody wanted to go home.) 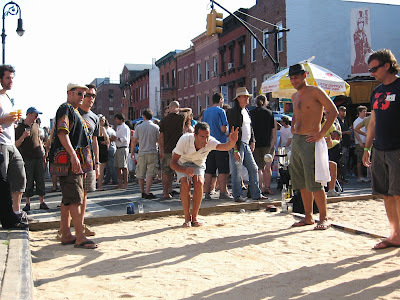 The street will be covered in sand for the famous petanque tournament, played with tennis-ball-sized metal balls. 80 teams from around the world are competing this year, and the competition will be fierce. Bar Tabac is a major sponsor (along with Robin des Bois and Ricard). Last year, people were dancing in the street, and the Blue Orchard orchestra (right) made you feel like you were in Paris. An exciting skateboard tournament will be held on the north end of Smith Street as well. UPDATE: Ever wonder how Smith Street gets covered in so much sand? See here. 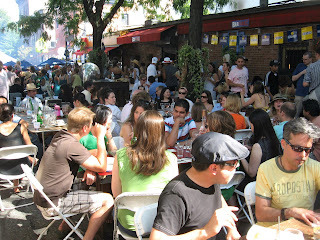 UPDATE2: Photos of the 2009 Bastille Day happenings here. Does This Mean They're Hungry?